It is assumed that Reddick Bryan was living in Twiggs County, Georgia in 1818. It is unknown when he actually made the trip. He probably came with his family; a wife and two young sons. Or, maybe just two young sons as it is unknown as to when his first wife died. 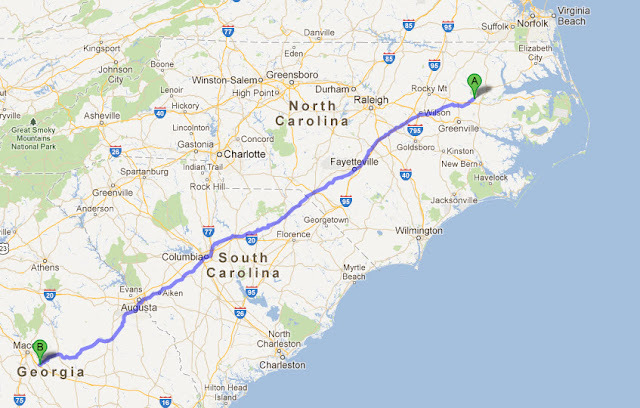 The trip from Reddick's home of Martin County, NC to Twiggs County, GA is slightly less than 500 miles and according to Google Maps, it would take 152 hours to walk. I would imagine that it would be a little faster by horse. Did he travel with a group? Where did he stop along the way? Did he visit other family members as part of his journey? He would have traveled through South Carolina, close to Florence, where other Martin County Bryans had relocated. Will be sold on the 13th of next month, at the late residence of James Bryan, deceased, in Twiggs County; all the personal property of said deceased; consisting of horses, hogs, household and kitchen furniture. (signed) Henry Mathews, Redick Bryan, Adm'r. Who was Henry Mathews and why was he also an administrator? Was James Bryan the father of Reddick? On August 24, 1818, Reddick purchased a cow and yearling from the estate of Needham Bryant of Pulaski County, Georgia. The purchase price was $37.75 and the note for the sale was vouched for by Jesse Sutton for the amount of $37.871/2. Span Regan was born on April 01, 1818 to Elizabeth Regan and her first husband Joseph Regan. There is conflicting information about Span's place of birth as various records indicate both North Carolina and Georgia.